SculptaMold Plaster Mache Blending Compound . 4lb. Eco-Pak featuring a moisture-tight zipper bag. Detailed instructions enclosed. SculptaMold combines the best features of clay, plaster and paper mache. 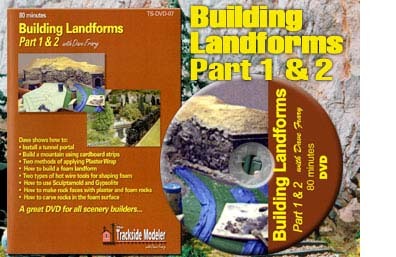 Shipped in a dry form it is easily prepared by adding water and can be immediately modeled with fingers or tools. SculptaMold may be worked for several minutes. Up to 90 minutes of working time! The slow setting allows very subtle details to be applied. It is best to mix in small quantities as needed. It does not shrink, so it may be applied on an armature or over any core of Styrofoam, PlasterWrap , wadded newspaper, plywood or homasote board. SculptaMold adheres to most clean surfaces, including Masonite and urethane castings, so it is ideal for all forms of terrain forms. It is very l lightweight and permits the creation of large pieces which are strong and durable, but not heavy. When dry, details may be carved with a simple Xacto Knife. Think of all the possibilities you can do such as masonry stone walls, cobblestone streets and fine strata-layers. SculptaMold can be painted with water-based paints and washes. It has the same density as plasters and HydroCal. Dave's Tips! Never apply a wet plaster product such as SculptaMold to an already dry layer of plaster like PlasterWrap. The two will never bond and will eventually flake off. Always mist "wet water" to re-moisten the dried base layer before applying any 2nd layer of wet plaster. Always apply Wet Plaster to Wet Plaster! The two layers will fuse and make a permanent bond. VIDEO HOW-TO: Who better can we get to demo SculptaMold than Dave Frary. Click the video below and watch The Best! See Dave give his spin on the working qualities of SculptaMold seen by thousands of mesmerized spectators around the globe. 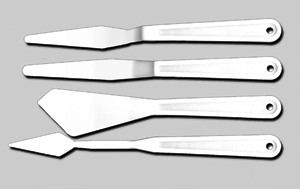 Superior quality Sculpting Palette Knife Set has 4 versatile knives for unlimited applications in HydroCal, Gypsolite or SculptaMold. Set is made of durable nylon which resists abrasion and stays sharp for a long time.